Here's some magnetograms of natural and man-made phenomena, recorded with an early prototype version of my magnetometer. The instrument has not been calibrated in any way, so the magnetic field is expressed in "arbitrary units" (something on the order of 10 units per nanotesla). 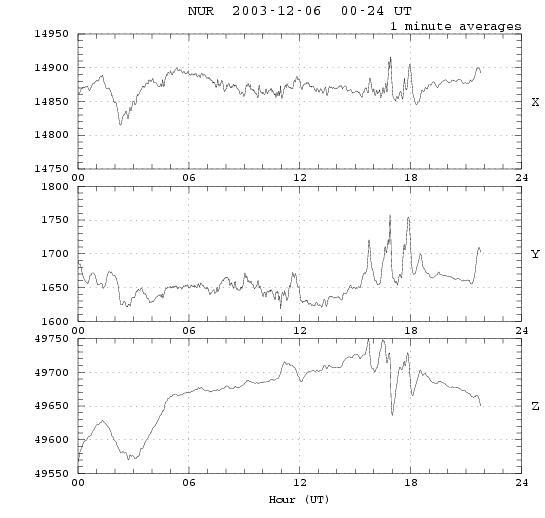 This is an actual geomagnetic field plot (the first one I recorded with my magnetometer), recorded on the 6th of December 2003. Values are one-minute averages. For comparison, here is a plot from the Finnish Meteorological Institute's professional research-grade magnetometer at Nurmijärvi, at the same time—observe the X-component. Note that this was not an actual geomagnetic storm: fullscale variation in X is on the order of only a hundred nanotesla. Wow, my magnetometer gave nearly identical data! Increase the sample rate a bit. This is a battery-operated alarm clock, and the sample rate looks like 50 samples/sec. At t=350 the clock begins to ring—time to wake up! This is also at 4500 samples/sec: My Canon EOS-3 camera takes a photo. The 1/2 second exposure time is clearly visible (from about 1000 to 3200 on the time axis). Lots of 50 Hz hum as well—that's why I usually have a larger capacitor in the low-pass filter.